The last Wednesday was spent with BFF painting the town red. Lot of shopping for my upcoming school reunion, for instance. Having gone to an all girls' boarding school, the level of attachment to my alma mater is of some other level. And its the first ever reunion that I'm attending so the outfit has to be perfect. I shall of course post pictures of that too. I found the perfect dress at Zara and the perfect accessories at Forever 21. Back to my very girlie evening, we dined at a fancy Italian restaurant followed by drinks at a Greek Lounge. El Perfecto. I carried my Forever New white bag which I paired off with a pink dress from Witchery, grey tights and a Grey long cover from a store(I cannot recall the name) in the Queen Victoria Building, Sydney. Being the biggest lover of tights, the grey tights were to simmer the color of the dress. The bag has these beautiful white flowers with pearl detailing on them and I'm quite fixated with it. Ouzo, as they call it in Greek is a must for all girl time together! BFF and I are becoming pros at photographing each other. This is not a complete shot, but it shows a part of my tunic dress and the frilly details of my grey woollen cover behind me. Greys with frills, nets and sequins remain a classic favourite this season and also the perfect color to brave the nip in the air with. Tell me what you think. And all that you've been upto all of this week coz this week for me was absolute insanity coz of all the festivities. Also, as most of you know I'm a writer there are some pieces I post on another blog Le Melange and I recently added another one which received much acclaim. Go through it if you like and tell me what you think. That first shot is indeed quite good! :) Will check out of other blog soon too! i love the tweed bag ! that's a gorgeous bag! you have a very pretty smile :) your blog is stunning, would you like to follow/bloglove each other? you have a lovely blog! you look like you had such a fun time :) love the grey ruffly coat! I really like the white purse, so cute!! I just came across your blog. Love your post. im arleady following my dear. follow mine ...wink wink. youre so young n yet so out there. good for you. 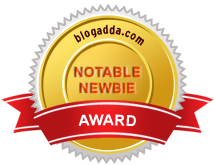 how do you have blog awards when youve only been blogging for a few months . you're amazing. And I loooove that bag! Step by my blog! _I´ve been so lazy this days, but I´m back again! to keep this blog tha flame up! What fun shots and those gray tights are great! Thanks for stopping by my blog - I totally want all those Lanvin for H&M dresses too! oh and I forgot to mention! Lovely photos and I like your blog! I like the bag in the first photos!